How important is mobile to your recruiting success? We confess: Years ago, our signature software barely worked on mobile, but we learned how important mobile access is to drivers and we upgraded our platform to be mobile-friendly. From the very first day, the percentage of IntelliApps submitted on mobile devices jumped from 0% to 13%. 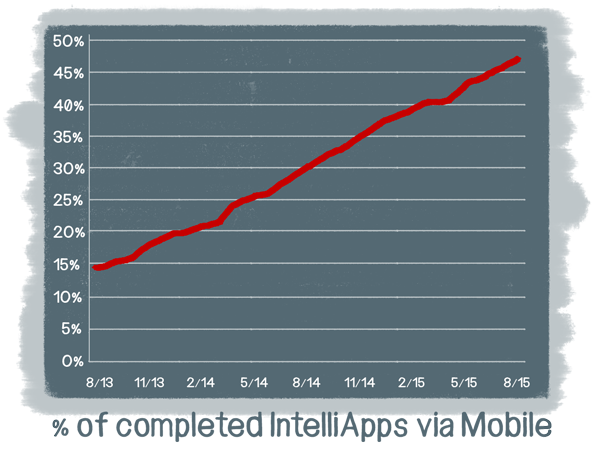 It has continued to increase daily, from 13% to a whopping 48% as of September 2015. Update: As of January 2017 62% of drivers submitted IntelliApps from mobile devices. • Androids outnumber iOS devices 3 to 1. • Of the Android traffic, smartphones (small screens) outnumber tablets 9 to 1. • Of the iOS traffic, smartphones outnumber tablets 3 to 1. Put simply, we learned drivers prefer Android phones to iPhones and smartphones to tablets. This data tells us that a carrier’s online recruiting process must not only be mobile-friendly but also optimized for small screens to accommodate the majority of smartphone users. The knee-jerk reaction—“Build a Mobile App”? Often, carriers have a knee-jerk reaction to this type of data—they decide they need to create a proprietary mobile app for their driver applications. However, this is a horrible idea from a user’s perspective. Look at it this way: A driver has clicked on your pay-per-click ad, read your landing page, and is ready to fill out a job application. Do you think this is the best time to ask them to go to an app store to download and install an app on their phone before filling out an application? Another reaction is to create shorter applications that are easier to fill out on mobile devices. The problem with this solution is that shortened or “mini” applications don’t give recruiters the information necessary to move drivers through the recruiting process. 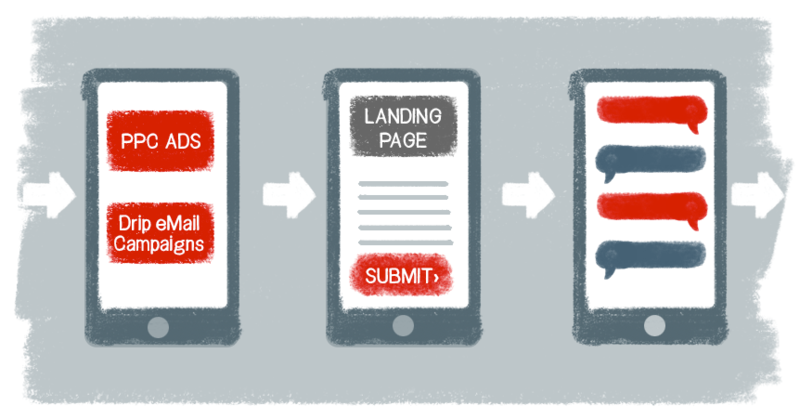 To take advantage of this mobile world, your entire process needs to be optimized for mobile. Drivers are more likely to do web research and answer drip email campaigns on their mobile. Every piece of your process needs to be mobile-friendly from the landing page to the application, the follow-up, and the hiring process. Mobile applications are difficult if the driver has to type in a lot of history information. At Tenstreet, we have solved this problem by auto-magically filling out the application for the driver via the IntelliApp Auto-Populate feature. Using Auto-populate, some drivers have completed a full application on their smartphones in less than 2 minutes. It’s important to understand that mobile is more than just screen size. It’s the pace at which business moves. Drivers expect a faster response time from a mobile application than from a paper application. Drivers who submit a paper application expect someone to get back to them within a couple days. Drivers who submit an online application from a mobile device expect a response much faster. They expect a recruiter to make a meaningful connection (more than a canned response email) within hours. If you are not able to connect with them quickly via phone, text or chat it’s likely your competition will or they will simply move on. This new mobile workflow hiring process can happen within days instead of weeks. It is clear truck drivers are using mobile devices more than ever. They research carriers, read marketing emails, view landing pages, and fill out applications—all from their smartphones and tablets. What’s more, after submitting an application, they expect a quick response. Any carrier who wants to succeed needs an online workflow that accommodates this mobile world. Keeping up with the pace of mobile is not an easy task, but with the right tools in place and a clear strategy the return is worth the effort. At Tenstreet, we have several solutions to help you manage your mobile recruiting workflow. Each solution is integrated seamlessly into our mobile-friendly software platform. Plus our Driver Pulse app keeps drivers in the loop of the hiring process like never before. Schedule a consultation today to learn more about how we can help you maximize your recruiting efforts. I have applicants that said the mobile app is not user friendly. Do we need to change our set-up with Tenstreet to make our application mobile friendly? And if yes, what is the cost? Is there a fee for the consult mentioned in your post? No, there is never a charge for a consult – I’ll let your advisor, Meghan, know you have some questions. To answer your first question, all of our applications are mobile-friendly, but there may be some things we can do to make things easier for your drivers. Meghan will be reaching out soon!